The 54â€ Sq. 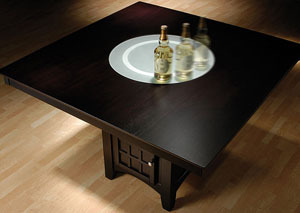 Counter Table Features A Built In 24â€ Frosted Glass Lazy Susan. This Entire Featured Collection Is Finished In Rich Cappuccino. Your Choice Of 3 Different Style 24â€h Barstools.